Roger Patterson with his drawing, demonstrating height. Image courtesy of Larry Lund. Here in this issue you will find links and player boxes full of our latest BLUFF CREEK FILM SITE PROJECT SUMMATION SERIES videos. These are, we promise, the last ones from Year One of the project. Is 45 of them enough for you? Well, watch out. Many more will be coming up this summer. What we don't understand requires humility of us. That which we do understand requires responsibility. Recently, the members of the aforementioned project from last summer and fall met in Cinnabar Sam's Restaurant in Willow Creek to discuss what we had seen, what conclusions we had come to, and where future investigation might lead in our quest to find the true PATTERSON-GIMLIN FILM site location. We've found one thing consistently to be true: the more one looks into this strangely convoluted issue the more confounding it becomes. It drives some insane, on both the believer and the skeptical sides. Some of the history is so contradictory that we ourselves often feel despair of ever finding the true site, or the true sequece of events. Still, we have some darn good new leads, and we will persevere into next summer. After about EIGHT HOURS worth of YouTube video (more than a European art film's worth), we sure hope we haven't scared you off!!! *BRAND NEW SERIES! * Here is video number thirty-seven of THE BLUFF CREEK FILM SITE PROJECT. Check out our new sub-series of SUMMATION videos, shot at Cinnabar Sam's restaurant in Willow Creek. There should be five or so of these, and then on to the coming summer. Here is video number thirty-eight of THE BLUFF CREEK FILM SITE PROJECT. Here we go over the topo and road maps to show you how to get around in Bluff Creek basin and find the PGF site area. Check out our new sub-series of SUMMATION videos, shot at Cinnabar Sam's restaurant in Willow Creek. On BFRO-VIDEOS on YouTube. Here is video number thirty-nine of THE BLUFF CREEK FILM SITE PROJECT. Here we go over the topo maps and new developments and leads found since our October on-site filming. Unpublished photos from Larry Lund and Thomas Steenburg may show new views and clues of the PGF location. This is our new sub-series of SUMMATION videos, on BFRO-VIDEOS on YouTube. Here is video number FORTY of THE BLUFF CREEK FILM SITE PROJECT. More poring over old maps, aerial photos and books, hopefully helping us find the true PGF location. Some new research directions are indicated. Here is video number FORTY-ONE of THE BLUFF CREEK FILM SITE PROJECT. Poring over maps, general thoughts on what we can rule out, and analysis of factors of old logging and creedbed movement over time. Also, did Byrne smoke ganja in India? Here is video number FORTY-TWO of THE BLUFF CREEK FILM SITE PROJECT. We find common features among the old PGF site photos spanning ten years, including old stumps and prominent downed logs. Here is video number FORTY-THREE of THE BLUFF CREEK FILM SITE PROJECT. Geeking out on old photos again, we come to some conclusions and ideas for future research. This is our new sub-series of SUMMATION videos, on BFRO-VIDEOS on YouTube. Trust me, this series is almost done! Here is video number FORTY-FIVE of THE BLUFF CREEK FILM SITE PROJECT. Here we ask, What have we learned? Plus, Rip Lyttle Speaks! Do beer and marijuana work as field research tools and Bigfoot attractants? Find out! This the last of our sub-series of SUMMATION videos, on BFRO-VIDEOS on YouTube. That's all folks, for now, believe it or not! Thanks to ALL who have helped us in any way! Yes, even you, too, Bobbie. If you have any additional information or experience going to the real, true PGF site, do CONTACT US HERE. Thanks to the BFRO for hosting all of these on their account, and for the fine background support they always provide in The Quest. If the player boxes above don't work on your computer or phone just visit BFRO-VIDEOS on YouTube, and look under UPLOADS, SEE ALL. See the links to the upper left side of this blog to access the earlier videos in this series. We'll let this one speak for itself. Leroy Blevins has made a large number of silly claims about the history of the PGF. For a year and a half now we've been correcting him in his errors. Every time we do, it seems, he changes his web site and things he's "found" and "seen" in the film and related footage. He is really good at after-the-fact self-censorship using the Orwellian memory hole that is the internet. Here is just one of those issues. The others we will get to later, in a future blog entry. 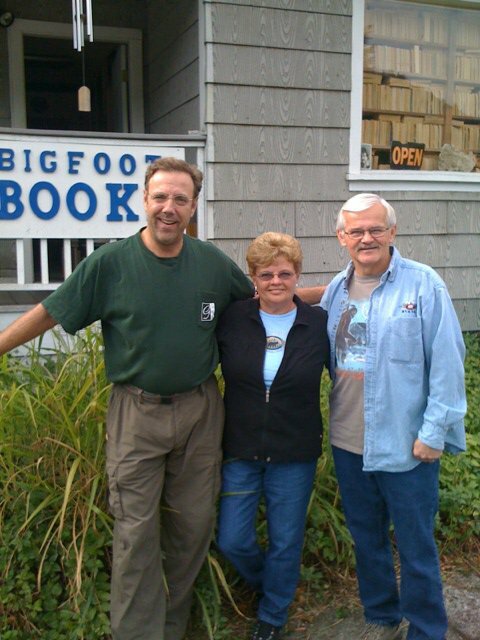 In Greg Long's book you are credited as the source of that photo of Patterson and Gimlin with Bob Hieronimus and the other guys from the days of the filming of Roger's docudrama in Yakima. You know, the one where they are sitting on horses in a line next to a big tree. Do you know who originally took this photo? A guy named Leroy Blevins, prone to conspiracy theories and other fallacies regarding the PGF, is going around calling this the "Larry Lund Photo," and claiming that it documents who was there in Bluff Creek in fall 1967 or whenever, when "the hoax" was perpetrated. (At least, that is what he *originally* claimed; now he is saying other things, as usual.) He claims you took the image. As far as I know this was not taken by you, and was not in Bluff Creek. Blevins thinks it proves there was a hoax. I think not. I've told him so. Could I get a brief statement from you I could quote to him regarding this issue? It would be greatly appreciated. Steven Streufert: Leroy is a man in a suit. Leroy Blevins: And Bob H is the man in a suit in the PG film. Steven Streufert: Maybe, but I doubt it. He can't even say WHERE the film site really is. Anyway, MAYBE Leroy has a suit AND a time machine with a link back to 1967? Leroy Blevins: You know that's funny about me and a time machine. 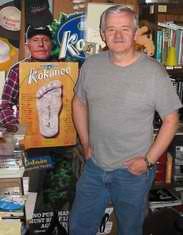 But, what you don't know is that the film known as the Patterson and Gimlin Bigfoot film was nothing more then a piece from Roger Patterson documentary that he was filming in 1967. Now Bob Gimlin never talks about the documentary and he tells a story that he have not seen Roger in some time and out of no where he comes to him and ask him to take him down to Bluff Creek when in fact Bob Gimlin was with Roger a lot when they was making Roger documentary film. 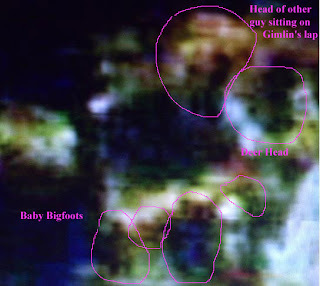 And you can see Bob Gimlin with a wig on in a photo taken by Larry Lund. Plus in an interview Bob Gimlin himself said he had nothing to do with the camera and that Roger had the camera with him the whole time. Even to this day he don't use a camera or even know how to use a camera. This was told by Bob Gimlin him self. The words out of his own mouth. Steven Streufert: What difference does it make? He was making a docu-drama, and also went out on serious expeditions. Nothing odd there. ALSO: that photo was not taken by Larry Lund, it was provided BY Lund to Greg Long. I believe it came from Jerry Merritt originally. Gimlin may have misspoken, or doesn't remember everything perfectly--that is totally normal. There are holes in every story all through history. Leroy Blevins: Now how can Jerry Merritt take a photo and also be in the photo? The photo of Roger and Bob with 4 other men on their horses was taken by Larry Lund. He owns that photo. When I came across the photo it said and a lot of places on the net said photo by Larry Lund. Leroy Blevins: But what does it matter who took the photo or not. The photo still shows what it shows. No matter who took the photo. Steven Streufert: I didn't say Merritt TOOK the photo, I said I thought Lund GOT it from Merritt. I have sent an email to Lund to get his official statement about this and WHERE and WHEN it was taken. You will be surprised, Leroy, unless you now think the PGF was shot in Yakima in the summer. The photo shows what it shows, which is the cast of a fictional film being shot months BEFORE and separately from the Bluff Creek expedition. WHERE IS THE MYSTERY, man? "You know I was told by Bob H the photo was taken by Larry Lund in 1967. The photo was taken 15 miles behind Bob H home. This is what he told me. The documentary that Roger Patterson was filming was done in 1967 even the contract he signed was signed on May 26, 1967. However Bob Gimlin never talked about the documentary and he acts like he had nothing to do with the documentary. You know the funny thing is I don't base my research on what these men tell me. I base my research on what I found and can see. As you even know the story they tell it has changed a lot over the years. Just like even Bill Munns telling people he worked on the original film when in fact he worked on a copy of the film. Now here is one for you. Who is the person that owns the rights to the Film? and I mean the Patterson Bigfoot film." Steven Streufert: What do you "see" there? Let's see what Larry says. The rights are basically 50-50 Patricia Patterson and the Dahinden sons. No? say, "PAREIDOLIA"? Can you see the "man" "next" to "Gimlin"? Hint: "he" has red "hair" and is looking to the left side of the photo. Steven Streufert: Though Patterson also sold rights later to ANE, Dahinden won them in a lawsuit he filed originally with Gimlin. Now this means with no one claim full rights to the film that anyone can use the film. Steven Streufert: Rights were established in court, and the film IS NOT in the public domain. You can read much about this in Long's book. Rene owned print rights, to the extent that he didn't allow most earlier books to use more that frame 352. Patricia still receives payments for the TV/film uses. Legal rulings are clear, no disputes really remain. Though Green may feel there to be a moral right, which Dahinden basically stole by litigation. Munns said he worked from Patricia's 1st Gen copy of the film, by the way. He knows darn well that the original is missing or locked in a lawyer's vault in Florida. Steven Streufert Word just in from LARRY LUND, it will be published with permission. "guy hiding in the bushes." We even found baby Bigfoot. As Blevins would say, Pictures SHOW, words can lie. And so, we contacted Larry Lund. His reply…. Yes...You are absolutely correct. I did not take that photo of the cast lined up on their horses. I wasn't even there. The copy rights were signed over to me by my late friend, Jerry Lee Merritt. Jerry was my brother-in-law's (Gene Vincent-Be-Bop-A-Lula) lead guitar player a few years after the photo was taken. As Jerry told me, he handed his camera to one of the men helping on the site and it was this man that snapped the shot. That's all there is to it. As far as all of that other chatter about Bob Heironimus and the suit, that was blown apart years ago by many who knew him and his stories. He used to order videos and books from me years ago. His brother is one of the riders in the aforementioned photo. Most of what this Leroy Blevins has written is false. Rumors are terrible things, but certain people will listen and believe them to the end. We, who experienced these days at a closer range, know better and all we can do is ignore the false stories. Life goes on! Hope this helps. 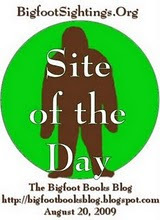 BIGFOOT BOOKS: That helps, greatly! May I publish this on my blog? And do you have a convenient digital copy of that image? cast photo were shot in Bluff Creek on the same spot. NOPE! Click to Enlarge. Perhaps, just to be clear to Blevins: Was it taken in Yakima? To your knowledge did any of those guys go to Bluff Creek save for P. and G.? Where do you think Roll Two went, and where is the full original PGF Roll One? Was there ever a Roll Three as Blevins claims? LARRY LUND: Here is my photo, but Not taken by me! And yes, you may publish this in your blog. The truth is out there...all you have to do is look for it and accept it for what it is. Do you have this one Steven ? non-Apocalyptic idiom. Drawn by Eric Devroeg. Thanks to Larry Lund! This was drawn by a very close friend of mine, Eric Devroeg, who passed away just a few years ago. He was in his mid-30's and a previous student of Grover's. He lived near me and close to Jerry Merritt's. The drawing was simply ment to honor some of the people he admired in the Bigfoot/Sasquatch field. You may post the photo, but to use it in any commercial way, you need to obtain permission from his mother, my friend, Sally Bartlett in southern California. Write me for any contact information. And I just noticed another part of your email I didn't answer. You asked about a third roll of film. The answer is no....not directly related to the Patterson/Gimlin film of the creature. Roger had shot lots of other scenery and horse footage. Rene pretty much had everything when he bought the movie rights and we watched them several times over the years. I even have a little video copy he gave me of Roger pouring a cast, but we could never prove it was a track from the Oct. 20th 1967 sighting. There are just too many blow hards out there claiming they have all the answers. They simply do not and most don't have a clue to what really went on and what real eveidence we all have. Too many fakes...hoaxes...and phonies out there. Claims are easy to make but very seldom are they proved. I always say, we have lots of evidence....but not one piece of absolute Proof ! BIGFOOT BOOKS: Are you saying you've seen the entire two film rolls? Can you describe the contents as sequentially and point-by-point, to the best of your memory? This is important not only regarding Blevins but also the MK massacre. LARRY LUND: Regardless of what is on those "Lost Feet" of film... MK Davis has hoaxed and faked and altered his way along the "Fame Trail" way too long. I have watched Rene Dahinden's excellent copy... or should I say copies... since MK was in Pampers and not any of the old 16mm film versions had any red running down the Creek ! Just go back ten years, Pre-M.K.B.S. and B.S. does not stand for just Bobbie Short. There is and never was any red flowing water or still puddles in the original films. The place to go for the "Other Roll" is the BBC, as Roger let them use it in a documentary in 1968 or 1969, I believe. I am really not sure what year, but Rene Dahinden had a copy of it, which may have been handed down to his sons Erik and Martin. It certainly wasn't in the 14 boxs of things Rene left to me. All I remember from back then was a bit of film showing John Green with another man and a couple of dogs, which was supposed to be down in the Bluff Creek area. Then the short footage of Roger pouring a track cast, which I already mentioned we can't prove was from Oct. 20, 1967. Hope this helps, but I truly don't believe this thing will ever come to a definitive answer. Those of us who been there since the begining, almost 44 years now, mostly believe it is a true account of what happened. I understand that the Newbies and hanger-ons that come out of the woodwork on a semi-daily basis think they have all the answers... but so far they have nothing and have proven nothing. Either way, I hope it is solved sometime in the new future. Too many good people have wasted a good portion of their lives on this one mystery. You may print this anywhere you wish. BIGFOOT BOOKS: I keep hearing that Roll Two was sent to the BBC, where it was cut up and lost, with only fragments surviving in their finished documentary. I also hear that Patterson incorporated some of this BBC work into his own "Bigfoot: America's Abominable Snowman," which he took on the road in theater showings. As far as I have been able to ascertain, both of these films are "lost." However, I have a nagging feeling that someone must have copies of them sitting around, either Al DeAtley or the Dahinden sons. There is much dispute over whether the Patterson pouring the casts footage is from Bluff Creek at the time of the PGF, or if it is a reenactment of the pouring of cast that he did either before the film was shot of after it. I'd really like to know the full contents of both reels of film, to refute the suppositions of conspiracy theorists and debunkers. As you know, we've spent a huge amount of effort trying to reconstruct the history and to find the film site, even the latter being now in dispute. It can get frustrating. People seemed not to care about the full context at the time, so concerned were they with and fixated upon the creature itself in the film. The Green and dogs footage was from earlier, in August and very early September, according to Green's books and what he has told me. Of course, MK thinks this was when the PGF was shot. John Green has vague recollections of the two film reels. The first he has parts of, showing scenery. He seemed to recall the second, with the scenes of Gimlin jumping off the log and the trackway prints. I'd like to reconstruct what was on those apprx. 5-minute rolls, as exactly as possible. Any memories you can bring forth would be very helpful indeed. LARRY LUND: Yes, it would be very nice to put it all together and get to the bottom of the mystery of what really happened back then. Unfortunately, the number of people who have tried for these last 44 years, would "Boggle The Mind" as Rene would say. And still nothing proven. Too many different stories and people mucking up the mix along the way. You even mentioned Al DeAtley and, surely, if there were copies made of the other reel or reels, he would have them. That small list would have to include Rene and John. But over the years I have not heard or seen any definite proof that copies were even made. It was said that Roger gave the original roll to the BBC and the rest is History. Never copied and never seen again. I have been in this from the begining and when it comes to this part of the adventure... I know nothing more than you do. Let's just promise to keep each other informed, should we hear more. BIGFOOT BOOKS: It boggles my mind indeed to think they never duplicated the entire reels. Is that what you think? That they only copied and cared about the Bigfoot part? Whatever happened to the original being "locked in a vault"? In the later BBC X-Creatures documentary Green is shown projecting a reel that looks about the right size to be a full copy. It has the scenery and packhorses. What do you think of that? Was Patterson just too ill or lazy to copy the trackway and casting roll before sending it to BBC? Was he just "over it" by then and past caring? I'd bet anything that DeAtley has the original touring film copies. It made them money, so he would have kept it. No? LARRY LUND: As far as Green showing that reel, it was probably not "The Copy Reel" as things like that are usually not used for these shows, I know because of the ones I have done for so many years. Most things are props and when it comes to old film, it is prefered not to actually run the real thing. Hard to say either way. I always thought that there were a few copies of those rolls made, but do not know for sure. It would be the sensible way, but also, Roger wasn't the best businessman. I just really don't know. any man move that quickly? He also sees a "Sasquatch" right to left of Gimlin. Good you have words to show from Larry Lund. But what can you show me that I was wrong was you there at the time of the filming? was Larry Lund there at the time of the filming? Show me the proof and not just soem more words told by someone. For words are just that words. Wrods can be added on just like stories people can add to that story aswell. I believe in what I see and not just words people tell you. I need to see. "As you show here in words by Larry Lund that ok maybe he did not take the photo but he did claim (horses and actors) and he said( cast lined up on their horses) You see even by Larry Lund he claims Roger Patterson and Bob Gimlin as actors. With Bob H. come on all the PG film was nothing more then a part from Roger Patterson documentary he filmed." BIGFOOT BOOKS: Words and documents are what history is made of. Pictures are subject to conjecture and imagination. Lund was NOT there; Merritt was. See the photo credits in Long's book. Leroy Blevins: Your wrong again I did not say this photo was taken at Bluff Creek [ACTUALLY, HE DID, BUT HAS NOW CHANGED HIS STORY] I said the photo was taken just 15 mile up in the woods behind Bob H house. He told me about the photo. And he also told me where the photo was taken at just 15 mile up in the woods behind his house in Washington. Now do you understand me.or do you need to add word to the story I told you to make people believe in you. Just like to know. docu-drama was shot in Bluff Creek. NOPE, NOT REEL TWO, Leroy! 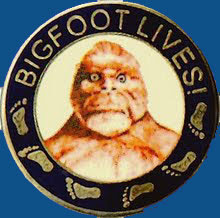 Bigfoot's bLog, from Bigfoot Books, Willow Creek: Leroy, as a MATTER OF FACT, you DID say it was taken in Bluff Creek. I have the old email to prove it. You have changed your story so darn many times (each time I correct you it seems you have a new web site) that I think it is clear that YOU are the hoaxer, not Patterson. Or, at least, Bob Heironimus is a liar, or does not remember anything correctly. Bigfoot's bLog, from Bigfoot Books, Willow Creek: Anyway, Leroy, it was ALREADY well known that this photo was taken in Yakima, and that it was from the docu-drama project Patterson was doing earlier that year, 1967. THEN he went to Bluff Creek later in the year. It could perhaps have been included in his film project, but that was essentially abandoned by October. The trip to California was an EXPEDITION, not a film project. I recall ever too clearly how you once claimed that the footage extant from the docudrama showing Jerry Merritt and others was shot in Bluff Creek, and was part of PGF Roll Two. NO IT WAS NOT. You said again that the tree in the above photo was the same "Big Tree" shown in the PGF and the image of Roger holding the print casts. 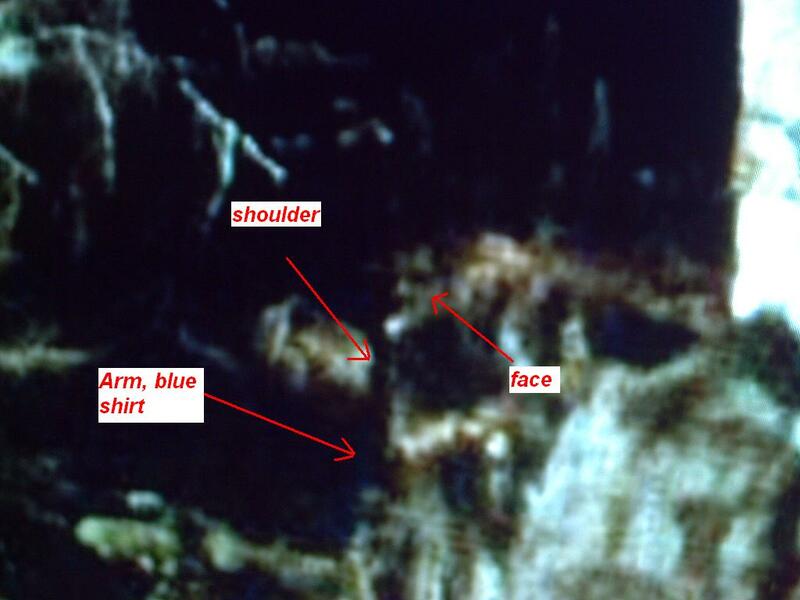 THEN you went on to claim that the ARGOSY article included these images from Yakima and the docu-drama, not only saying that (which was INCORRECT, as I showed you), but that they were taken in Bluff Creek. You can only change your story so often before people with just begin to think you are full of bull and hot methane gas. We'd put a web site link up here for Mr. Blevins' Bigfoot "debunking" work, but he seems to change his site address every time we prove that he has been wrong in his assumptions. This has happened several times in the last year and a half. Anyway, one may view his nutty and grammatically flawed presentations via his YouTube account HERE. Does Leroy believe in Bigfoot? Yes, he does. Bigfoot descended from the EDOMITES! Or go HERE, and read around a little bit, back and forward, in the forum. I'm wondering, does your copy of the PGF, as seen being shown in your home in the BBC X-Creatures documentary, contain the ENTIRE film roll as shot by Patterson? Or is in an assemblage of clips? If it does have the whole roll, is it possible that it could be published somehow? If it doesn't, do you know if one full copy still exists? think is absurd based on the foliage in the scenic shots. I'd imagine there is no reason it hasn't been published other than that it was not considered significant compared to the Bigfoot part. However, Roll Two WOULD have been highly significant... is there any chance that this roll was copied and exists somewhere, as the original was apparently lost to the BBC or ANE? There are others claiming that Patterson was in Bluff Creek over Labor Day, 1967, and that he faked the Onion/Blue Creek Mountain tracks. In your book you say he was in Mount St. Helens then, with Gimlin. This is an established fact, right? To my knowledge Patterson was in the Bluff Creek area only in October that year... isn't that so? JOHN GREEN: Rene and I certainly had the entire film roll to copy and I believe we did that, but it was over 40 years ago. I don't remember it containing anything other than the shots of Bob or Roger riding up the creek, then of the creature, all of which were copied. The only assemblage of clips was the film Rene and I put together for lectures using some of Rene's earlier footage, which led to Davis, Paulides, etc. thinking they had found something previously unknown. . I am sure Pat Patterson's copies would include the whole roll, and it is up to her as to publication. I have no knowledge of any part of the roll being "suppressed," and certainly didn't see anything on it there would be any point in suppressing. Anyone claiming that Patterson filmed the creature at an earlier part of the year than when the fall colors were evident must be colorblind. I don't know what happened to the second roll. It certainly has not surfaced in the past 40 years, but it did exist. I and many others saw it at the University of British Columbia showing. . I can't claim personal knowledge of where Patterson was around Labor Day, 1967, (or any other time I was not with him) but when we tried to contact him we were certainly told that he had been off Sasquatch hunting in western Washington. To suggest that he or anyone else faked the hundreds of Blue Creek Mountain tracks, with ample evidence of flexible feet, in a single night, is idiotic wishful thinking. In a half century no one has been able to demonstrate ability to do anything remotely approaching that. dimensions in his recreations and theories, and no real comparisons can be made. 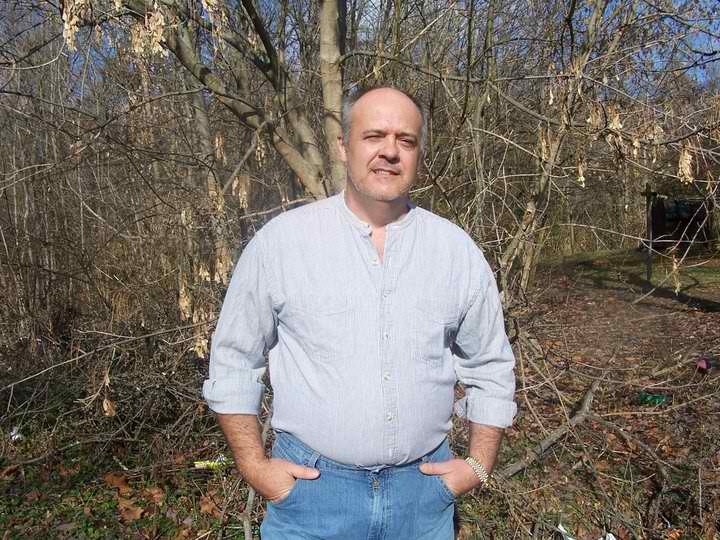 BIGFOOT BOOKS: Hi John, This fellow Blevins is saying that you do not believe the PGF shows a real Bigfoot. I assume that is not so, but perhaps you could provide a brief statement as to what you believe so that I may contradict his argument? I find that talking to this fellow only leads to further confusion on his part, as he then just extrapolates more false conclusions from any real data provided. By the way, I've been talking with Jim McClarin, and his information and memories have been very helpful. We will be back at the film site the weekend after this one to finish our filming and documentation. I'll keep you posted as to what we find. I'm pretty sure we have located the big background trees and maybe the original Patterson camp site. JOHN GREEN: I have tried reasoning with Blevins, to no avail. Nothing left to do but ignore him. 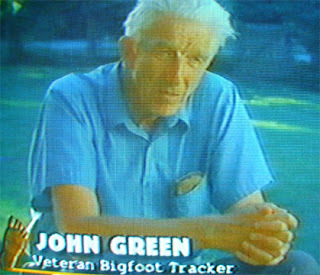 Of course the PGF shows a real bigfoot, and I have certainly never said otherwise, to him or anyone else. Was there a "Reel Three"? Blevins thinks so. Can you tell us exactly WHAT was on Reel Two, other than the tiny clips we have of the footprint casting and Roger by the tree? I mean, perhaps a brief synopsis. 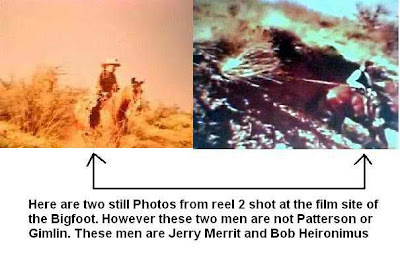 Blevins thinks that footage of the "cowboy" guys in the Yakima area, as well as that photo of them lined up on their horses (taken by Jerry Merritt?) made for the docudrama Roger was planning, were actually taken in Bluff Creek, and supposes they appeared on Reel Two. Obviously not, right? What source might we cite that could confirm Patterson or DeAtley might have had the film developed privately, outside of the regular Kodak processing offices? I can't recall on that one. Like MK, Blevins is conflating disparate events, films and photos, and is also trying to debunk the "timeline." Oh, one more thing: What was on Reel One, besides what we can see in that BBC X-Creatures documentary, where you are shown running the film on your projector for the host at your home? We see Roger riding by the red-leaved trees, Bob riding up the dirt road or wash, and some tree footage. What else was there? Blevins is coming up with conspiracy theories about those Yakima cowboy guys being there at Bluff Creek, and particularly a "hat" appearing in the footage of Gimlin riding along with the packhorse. It's crazy stuff, but I feel it needs to be refuted. JOHN GREEN: Sorry Steven, I'm afraid I can't be much help. I have never before heard any suggestion of Patterson taking a third reel but of course that doesn't prove he didn't. As to the second reel, I remember well that it showed the depth of the creature's footprints compared to the horse prints, because I argued with a zoologist at the time about that, but I don't recall anything else. I saw it only once, 43 years ago, and it was what was on the first reel that was important. The second reel certainly did not show anyone other than Bob and Roger, or show both of them together. Couldn't have missed that at the time or forgotten it since. DeAtley told us in the beginning that there was a reason he could not say how he got the film developed. We assumed he paid someone to do it in an unauthorized way. Later he has said he can't remember. The "hat", of course could be claimed to be a hat or anything else anyone imagines it to be. Well, that's all folks, for now! We'll get back to the Blevins carnival later. Me let Leroy and Steve handle angry this week. Me go read JREF now. You are all too funny, really. If you were the one who tried to post that last ridiculous ad hominem attack comment, well nice try. I deleted it as spam. If it really was you, as I assume, you really should consider that fallacies and slander do not advance your cause.